D-Amino acids are stereoisomers or optical isomers of naturally occurring L-amino acids. D Amino acids and L-amino acids have almost the same physical and chemical properties. D-Amino acids have been considered to be unnatural substances that are produced only when we synthesize amino acids in laboratories or factories. Indeed, equal amounts of D-amino acids and L-amino acids (racemic mixture) are produced by chemical synthesis. Until recently, living organisms were thought to contain exclusively L-amino acids. Before the emergence of life, D- and L-amino acids should have existed on the primitive earth, because amino acids are considered to be produced under the conditions of high temperature, high pressure and lightning. It is an interesting and important question why D-amino acids were eliminated and organisms have evolved using only L-amino acids. This mystery has not been solved. D-Amino acids have been considered exceptional amino acids that exist only in prokaryotes and a part of lower organisms. However, the development and improvement of analytical instruments and methods have revealed that D-amino acids are present in organisms far more in the amount and extent than previously considered. It has become clear that D-amino acids are present in invertebrates and vertebrates including humans and that some of D-amino acids have important physiological functions. Biological systems for synthesis and degradation of D-amino acids have also been found. 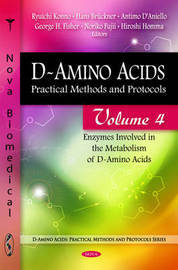 This volume is dedicated to analytical methods for the enzymes involved in the metabolism of D-Amino Acids.